By buying this product you can collect up to 179 loyalty points. Your cart will total 179 loyalty points that can be converted into a voucher of $1.79. 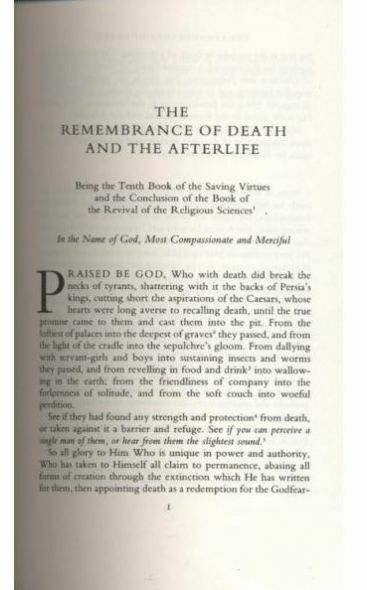 This is the first English translation of the last chapter of Al-Ghazali’s Revival of the Religious Sciences (Ihya’ ‘Ulum al-Din), widely regarded as the greatest work of Muslim spirituality. 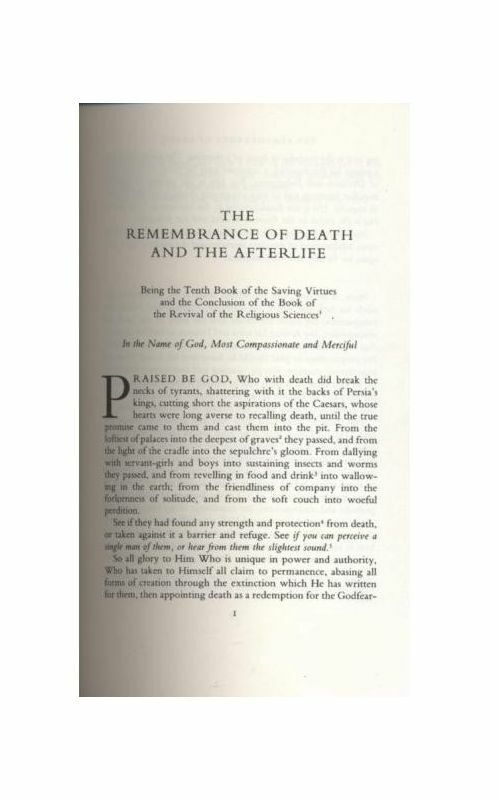 After expounding his Sufi philosophy of death and showing the importance of the contemplation of human mortality to the mystical way of self-purification, Ghazali takes his readers through the stages of the future life: the vision of the Angels of the Grave, the Resurrection, the Intercession of the Prophet, and finally, the torments of Hell, the delights of Paradise and - for the elect - the beatific vision of God’s Countenance. 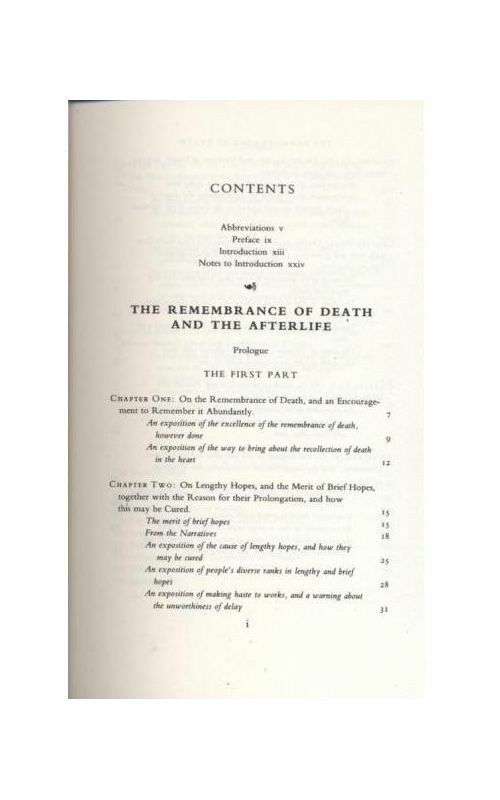 Know that the heart of the man who is engrossed in this world and is given over to its vanities and harbours love for its appetites must certainly be neglectful of the remembrance of death. Thus falling to recall it, when reminded of it he finds it odious and shies away. Such are the people of whom God has said: Say: Lo! the death from which ye shrink will surely meet you, and afterward ye will be returned unto the Knower of the Invisible and the Visible, and He will tell you what ye used to do. ’Now, men may be either engrossed [in the world], penitent beginners, or arrived gnostics. The man engrossed does not remember death, or, if he does, it is with regret for his world, and he busies himself with disparaging death. The remembrance of death increases such a one in nothing but distance from God. The penitent man recalls death frequently, so that fear and apprehension might thereby proceed from his heart, making his repentance complete. 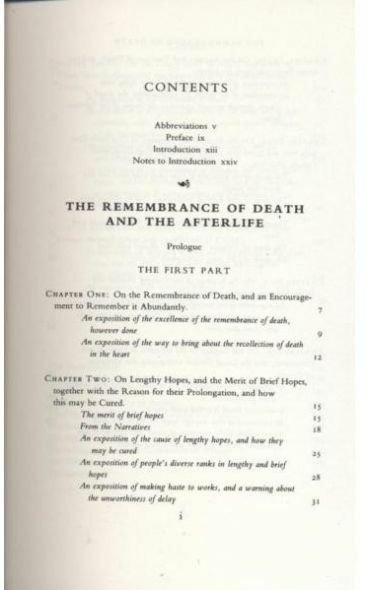 It may be that he is in fear of death lest it carry him off before his repentance is complete and before his provisions for the journey are replenished; lie is excusable in his aversion to death, and is riot included in the saying of the Prophet (may God bless him and grant him peace): ‘Whosoever would abhor meeting with God, God abhors meeting with him’. Such a man does not abhor death and meeting God, but only fears the meeting with God passing him by as a result of his deficiency and remissness. He is like the man who is made late for a meeting with his beloved by busying himself with preparations for the encounter in a way that will find approval: he is not deemed to be reluctant about the meeting! The distinguishing mark of the penitent man is his constant preparation for this matter and his lack of any other concern. Were he to be otherwise he would associate with the man engrossed in the world. Thus it is that the penitent man may be excused the aversion he feels for death, while another is excusable in loving it and longing for it. And higher than either of them is the degree of he that has entrusted his affair to God (Exalted is He!) and no longer prefers death or life for himself, for the dearest of things to him is that which is more beloved in the sight of his Lord. By virtue of profound love and loyalty this man has arrived at the station of absolute surrender and contentment, which is the goal, and the utmost limit. But whatever the situation may be, in the recollection of death there is reward and merit. For even the man engrossed in the world benefits from it by acquiring an aversion to this world, since it spoils his contentment and the fullness of his pleasure; and everything which spoils for man his pleasures and his appetites is one of the means of deliverance. Timothy John Winter (born in 1960), also known as Shaykh Abdal Hakim Murad, is a British Sunni Muslim Shaykh, researcher, writer and academic. He is the Dean of the Cambridge Muslim College, Director of Studies (Theology and Religious Studies) at Wolfson College and the Shaykh Zayed Lecturer in Islamic Studies at Cambridge University. His work includes publications on Islamic theology and Muslim-Christian relations. In 2003 he was awarded the Pilkington Teaching Prize by Cambridge University and in 2007 he was awarded the King Abdullah I Prize for Islamic Thought for his short booklet Bombing Without Moonlight. He has consistently been included in the "500 Most Influential Muslims" list published annually by the Royal Islamic Strategic Studies Centre and was ranked in 2012 as the 50th most influential.